This is Vinho Verde at its very best. Made from the popular Alvarinho grape (same as Spain's Albarino) by one of Portugal's most celebrated producers, Quinta do Soalheiro. Soalheiro were the first to plant Alvarinho seriously back in 1974 in Portugal and since the 1990s plantings have been booming here. Soalheiro make a wide variety of wines from this grape (still, sparkling, natural etc) - and this is their classic still version. The vineyards of Moncao and Melgaco in northern Portugal are so close to the border with NW Spain - just across the Minho river - but the styles of wine are different. Portuguese Alvarinho is fuller bodied, richer, riper, more citric and minerally than Spain's zippier melony slightly salty Rias Baixas Albarino. 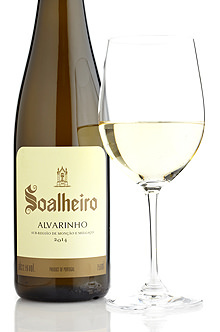 Alvarinho is a thick-skinned grape with fresh acid and rich texture - it matches particuarly well with rich textured seafood dishes. This wine was very popular with our diners at our recent Peat inn dinner - it matched beautifully with calamari and lobster.